If you are looking for an experience of wonder and beauty, then you must pay a visit to The Butterfly House at Melbourne Zoo. 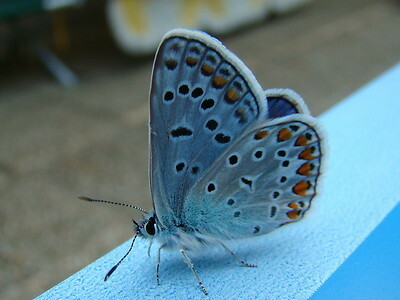 It is full of hundreds of colourful and varied species of butterflies, that fly around free, perching themselves on your shoulders, head, arms and hands. The Butterfly House is full of lush vegetation and greenery. It is simply majestic. 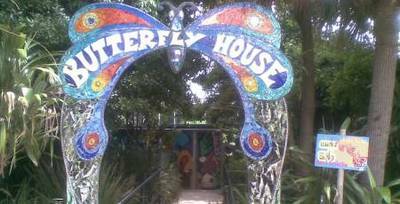 My visit to The Butterfly House remains one of the poignant memories of my life. My terminally ill Mum flew over to spend four weeks with her only daughter and we painted Melbourne bright red. We visited The Butterfly House and didn't want to leave, it was an exceptional experience. It really is so very, very beautiful. It's not your everyday experience either, you leave feeling inspired, feeling one with nature and feeling kissed by warmth. If you love photo opportunities, well then don't forget to take your camera. You will definitely find some Kodak moments. So spread your wings and flutter your way to The Butterfly House. Well don't just stand there! Cmon. Why? Get close to nature. Experience wonder and beauty. Cost: $12.60 -$25 for admission to Melbourne Zoo. Don't the gates look terrific now, they were done by a very talented friend of mine, the lovely Sioux dollman.